Do you live on main campus or University Park? If your answer is “no” then you’re a commuter student and we are here to help you! Salisbury University: It’s Worth the Trip! Commuter Connections is here to assist you throughout your Salisbury University experience. Whether you are an upperclassman who is living in your first apartment, an area resident who chose SU for college or a non-traditional student who has been out in the world and decided that SU is your next step, we provide programming, advocacy and resources for all students who are living off campus. Check out our schedule of events just for you – the commuting student. Looking for a home base where you can relax between classes and connect with other commuters? Check out the Commuter Lounge, located adjacent to Chick-fil-A on the first floor of the Guerrieri Student Union. We also have Off-Campus Housing Services that is your resource for finding off-campus housing and navigating living in the community. Let Commuter Connections get you over the hump! Meet other commuters, have a cup of coffee, grab a pastry, relax and get ready for the day. Pick up one of our travel mugs or bring your own! This get-together is held 8:30-10 a.m. every Wednesday during the academic year in the Commuter Lounge. Have lunch (for FREE) and learn. Staff members from various University offices drop in to talk with you about commuter resources available. Workshops take place over lunch, so you don’t have to skip a meal! Reserve your spot ahead of time @ commuterconnections@salisbury.edu. On select Mondays throughout the semester, stop by the Commuter Lounge from 1:30-2:30 p.m. and cool down with a free ice cream or warm up with free hot chocolate – depending on the weather! Need a mid-day snack? Grab some popcorn in the Commuter Lounge! We'll be popping popcorn 12:15-1 p.m. every Thursday throughout the semester. We have 18 different flavor salts to choose from as well! You can use GullRide to find other students and employees coming to campus who live near you and have similar schedules so you can share the ride. 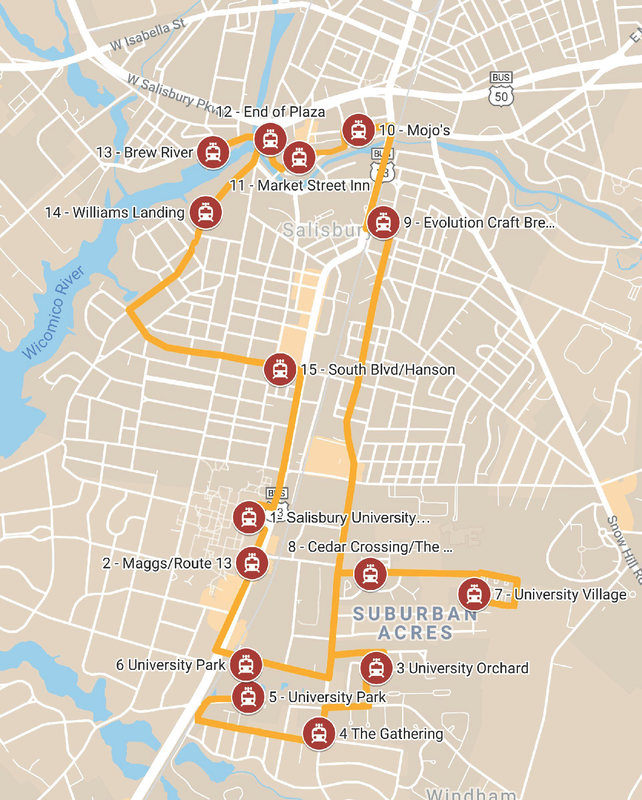 SU partners with Shore Transit to provide a weekday shuttle service with stops at University Park, University Village, Avery Parking Lot and the campus bus stop near the Guerrieri Academic Commons. Want to know when the next shuttle bus is arriving at your stop? Visit NEXTBus for the latest tracking information. SU’s Stay Street Smart Sea Gulls campaign is an effort to help those walking and biking stay safe when navigating around campus. Enter your bike’s information into the SU Police database of bicycles (and laptops, too!) to aid in finding your bike just in case yours ever goes missing. Need to get downtown on a Thursday or Friday? Use the Trolley! Free rides with your SU or UMES ID, or $1 without ID. Check out the Trolley Schedule and Trolley Map Route to find your ride! Off-Campus Housing Services Link to new page that is being built with this batch has created a series of brochures to guide you through living off campus, living off campus safely and being a good neighbor. The Condition Checklists helps you assess the status of your new place before you move in – we’ve thought of everything! Trying to decide which place is for you? We have a handy Housing Comparison Worksheet that lets you review your options point by point. Your roommates are your partners in safety, so use the Roommate Emergency Cheat Sheet so you have a one-stop record of your contact information and special situations – just in case. Choosing a roommate is a big decision, this Roommate Questionnaire helps you all understand what each other expects before you sign the lease. Once you understand each other’s roommate expectations, this Sample Roommate Contract can be used to spell it all out so there is no confusion.